Just for kids, our Kids Pak 80mm Telescope bundle is perfect for your little stargazers. We've included a handy laminated Lunar features card and a star chart wheel. Also, the Kids Pak comes with Twinstar's The Moon Map, Ultimate Factivity Collection Space book, and other goodies to teach your child the basics of star gazing and constellations. This is the most versatile optical instrument you will ever own. Perfect for astronomy, hunting, bird watching, or cityscape gazing, this refractor scope provides an impressive view. With a full-coated achromatic 80mm primary objective lens and a short 400mm focal length, this little bundle of power packs a super-fast F/5.0, which means it is the perfect light-gathering instrument for getting great views of birds or animals in darker shaded areas, and you will see clear, bright images of anything through either of the two powerful Kellner eyepieces. Images are seen right-side up through a 45 degree angle prism, so this telescope is ready-to-use for daytime earth-bound observing. This is also a terrific choice for wide-field and deep space astronomy. 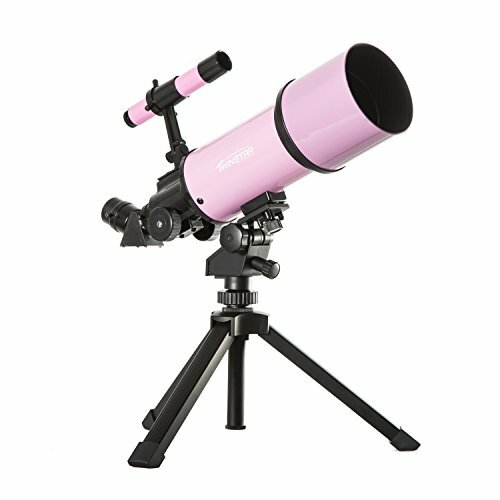 Of course, for the backyard astronomer, this telescope is ideal and is a great introductory telescope if you are serious about learning all about astronomy. With its tremendous light-gathering power, in dark skies you can observe fabulous nebulae, galaxies, binary star systems and most of the famed deep-space Messier objects. Of course, with this telescope, you can see outstanding detail when viewing the moon and you can see you can see the Rings of Saturn and the Moons of Jupiter. Also, a Mini Tripod & Carry Case is included with your purchase. Take it on camping trips, hunting excursions, to the beach, to the mountains, overseas, or just stick it in your car "just in case" there's something to see. The mini "Instant Use" tripod fits right inside the carry bag. Of course, the telescope mount will fit any standard full-size photographic tripod as well. The Kids Pak also features: Twinstar's The Moon Map, Ultimate Factivity Collection Space book, and 12 Glow-in-the-Dark Star Stickers! If you have any questions about this product by Twin Star, contact us by completing and submitting the form below. If you are looking for a specif part number, please include it with your message.